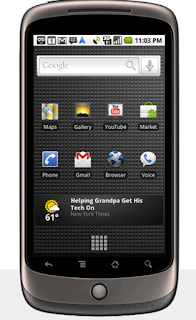 In addition, the Nexus One will deliver 2G/EDGE speeds on these networks and also supports WiFi. These cover most major GSM mobile providers worldwide; however, if you're unsure of the bands supported by your mobile service provider, please contact your provider directly prior to purchase. In a blog post, Google explained that Canadians can choose from two versions of the Nexus One, each of which work on different 3G cellular frequencies. The version introduced in the United States in January works on T-Mobile's U.S. network. The new version introduced on Tuesday works on AT&T's network in the United States and on Rogers in Canada. A spokesperson for Google Canada added that the Nexus One had been successfully tested on the Rogers and Wind Mobile networks, which use the same respective frequencies as AT&T and T-Mobile in the United States. She declined to say whether it would work on the new network recently rolled out by Bell and Telus, and could not say why the company chose to make two separate phones rather than one that works on both types of 3G frequencies. "It's an ongoing project to extend the availability around the world," the spokesperson said. "We'll continue to launch more phones that work on different networks and providers." Google's (GOOG) share price was up slightly to finish the day at $565.20.